The sample timeline chart below has been filled in to demonstrate how you can summarize the detailed information about program implementation. Below this chart is an empty table that you can copy and paste. You can use it as a template and modify it for your own objectives and activities. Be sure to format and organize the grant headings exactly the way the Request for Proposal (RFP) requests. Answer all the questions in the order listed, and use the headings, subheadings, and numbers provided. Be sure to submit the number of copies the grantmaker requests. Include a cover letter to introduce your organization and your request, and to make a strategic link between your proposal and the funder's mission and grant making interests. Grant proposals should be typed and look professional. Make sure the grant is easily readable (e.g., the font size is not too small). Keep an electronic copy of the proposal for future reference. This can be adapted or modified for future proposals. Find out if you need to register to submit an application. Contact the funder to let them know you are applying, or set up a profile before submitting a grant (e.g., a federal grant needs a DUNS number). If any of these steps are required, make sure you complete them well in advance of the grant’s due date. If you contact the grantmaking agency, be sure to state not only your name, but also the group you are with. Find out if the grant needs a letter of intent (LOI), and submit one by the due date if required. Determine if you need letters of support or if you need potential partners to sign an MOU (Memorandum of Understanding). Pay attention to how reviewers are going to score various aspects of the grant, and give higher priority (proposal length, etc.) to areas that are more heavily weighted. When writing the grant, use bold or italics for emphasis of key points. Note that it is fairly common to need to include the following in the Appendices: proof of non-profit status, staffing overview or organizational chart (including board, staff, and volunteer involvement), and an audited income or expense statement. Once the grant is written, review it for clarity and consistency. Although grant applications are often a team effort, the final grant application should have one voice. It should read as if it were written with the consistent language of one writer. Be sure to make a strong case for the overall significance of the proposal and prospects for success. (State WHY this project should be done: a) at all, b) in this community, c) at this time, and d) by this organization. Be sure to ask questions of the funder, if needed – but read the application well and think before asking. If your organization is granted funding, there will likely be periodic reporting requirements to the funding agency. 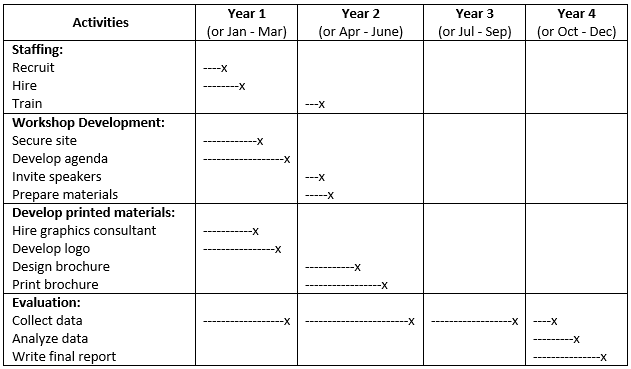 This is an example of a timeline chart for program implementation. 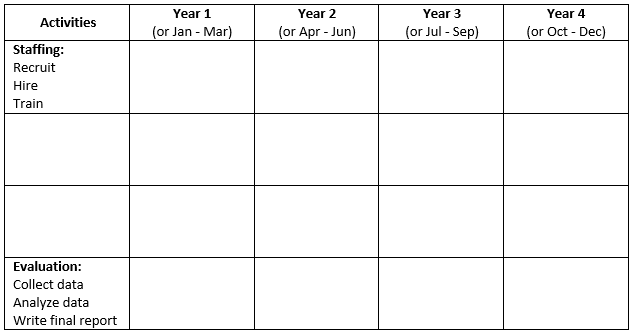 This is a timeline chart for program implementation that has been left blank for users to fill in according to their needs.